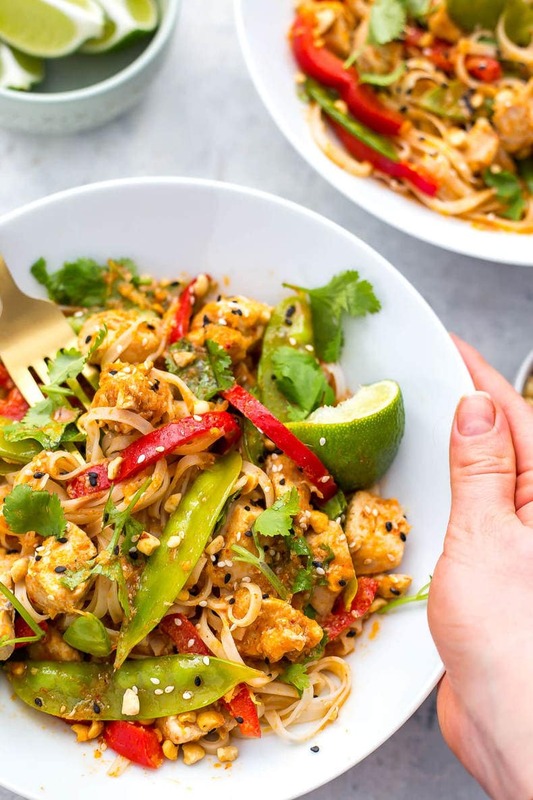 These Instant Pot Red Curry Chicken Noodles come together in less than 30 minutes in the pressure cooker. 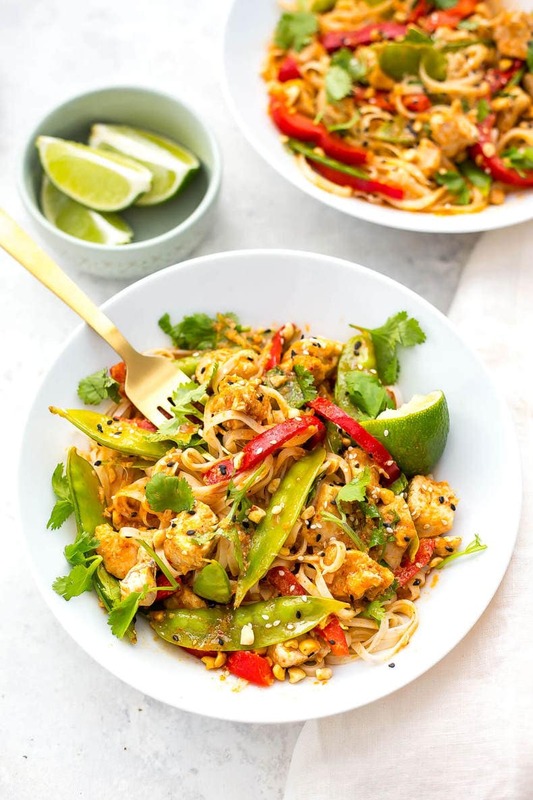 It's a healthy Thai-inspired dinner idea! Let me tell you about my latest Instant Pot favourite. Instant Pot Red Curry Chicken Noodles. OMG, could you even dream up a better dinner idea? It's basically your favourite Thai curry, all whipped up in about 10 or 15 minutes in the Instant Pot and then you add noodles. Dream team right here. Again, this is one of those back pocket recipes you can save for a rainy day when you're running out of inspiration and you need to pull something together really fast. Throw in some chicken, red curry paste, coconut milk and soy sauce, then let it all cook up. 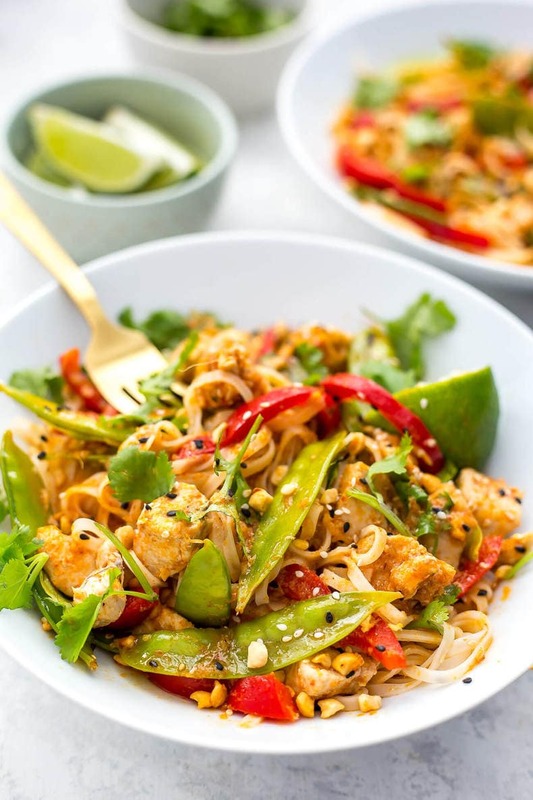 Throw in your veggies and let them cook in the hot coconut curry sauce for 5 minutes, then throw it all over some rice noodles and use up some pantry staples like chopped peanuts and sesame seeds. Dinner in under 20! And leftovers for the whole week long if you plan it right! I know these Instant Pot Red Curry Chicken Noodles look super fancy and complicated but I promise you they're not. And you can pair the curry with rice or quinoa if that's what you're into as well. Either cook the rice/quinoa separately on the stovetop or in a rice cooker, or if you want the curry to soak up the rice as opposed to acting as a side, you could throw some dry rice in with the rest of the ingredients and cook on high pressure for 4 minutes. I did the same sort of thing with these Instant Pot Chicken Burrito Bowls and they turned out sooooooo good. That's what I LOVE about the Instant Pot. It's literally a dump and push start kind of appliance. 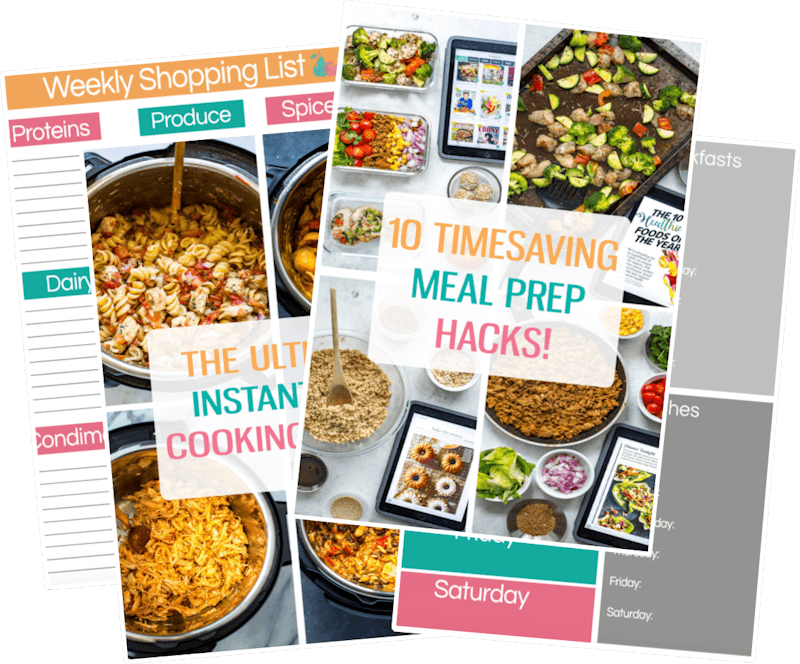 Pretty much anything you can make in the slow cooker or in one pot you can make in an Instant Pot, and you can make super large quantities so you have plenty of leftovers for the work week. 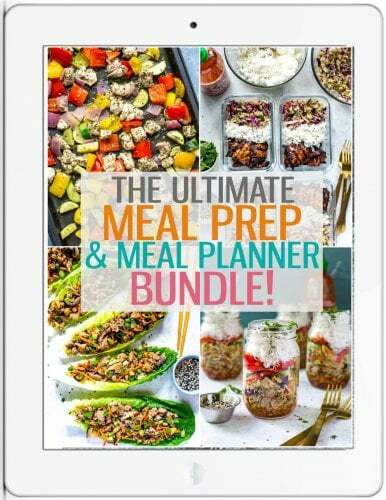 It's seriously meal prepping made easy, and I always need more of that in my life. I love how quickly it cooks chicken too because I feel like that's one of the biggest hurdles people have in making dinner – they don't want to do all the prep work and then stand by the stove and cook something, or attend to the oven. Literally with the Instant Pot you dump everything in, set it to pressure cook, Netflix and chill for 10 or 15 minutes, then get up and serve dinner. Or portion everything out for a week's worth of lunches. I love it. 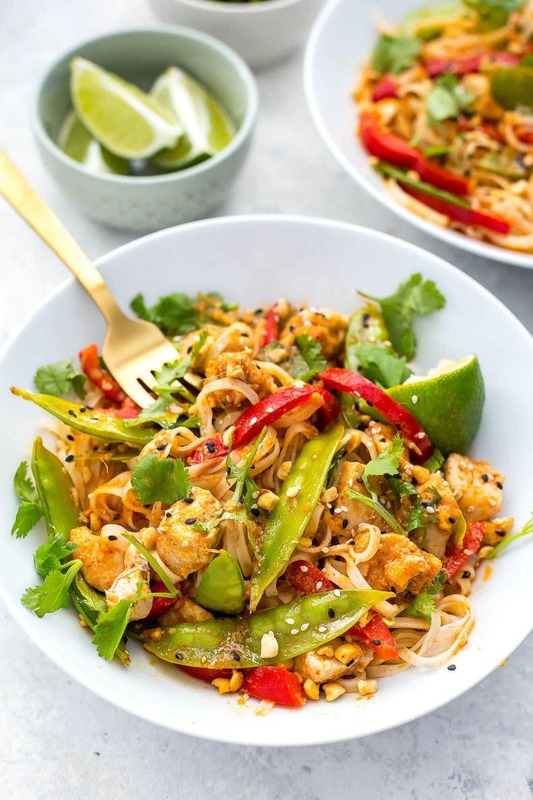 With these Instant Pot Red Curry Chicken Noodles you're basically just going to want to make sure you have fresh herbs like cilantro and some fresh veggies to add in with the chicken and noodles to make sure it's a proper meal. From there, you've got a world full of flavour. As for the red curry paste, you can buy it from the store (I like the Thai Kitchen, Blue Dragon and Aroy-D brands) or you can make your own at home. 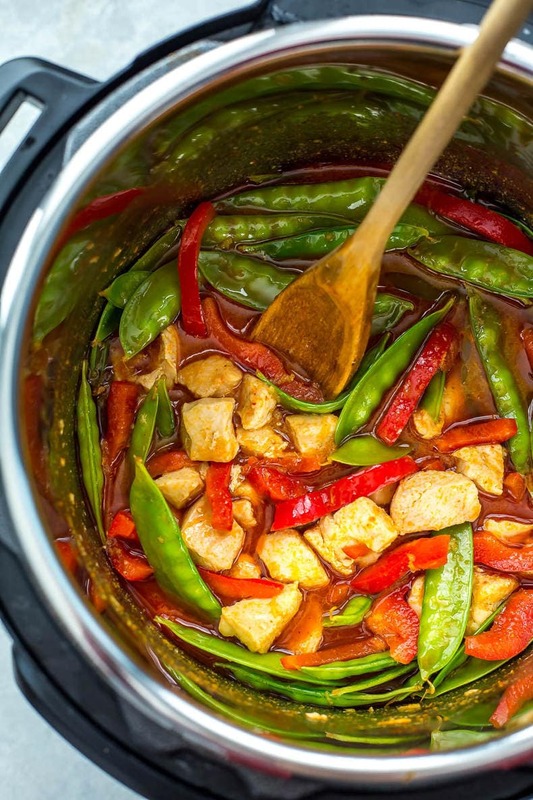 It's fairly easy and my friend Kristen has this delicious red curry paste I can personally vouch for on her blog if you're looking to turn this into more of a cooking project. To be fair, you can also make the red curry paste and then freeze it in small batches because you usually only need a little bit at a time, especially if you make yours spicy like I do! 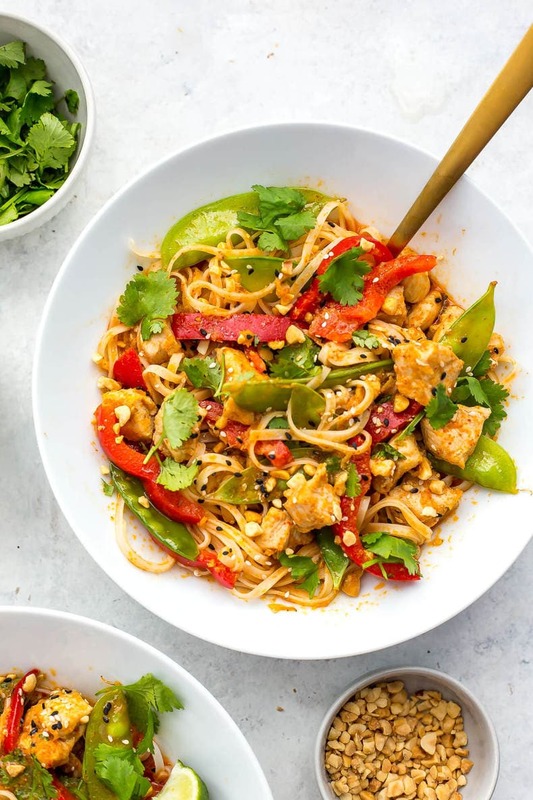 Will you be making these Instant Pot Red Curry Chicken Noodles? I think I'm going to start making all kinds of delicious curries in this thing…next up is Thai green curry, maybe a spin on this Butternut Squash Chicken Curry or even this Lentil Dal? Ugh, gimme more! 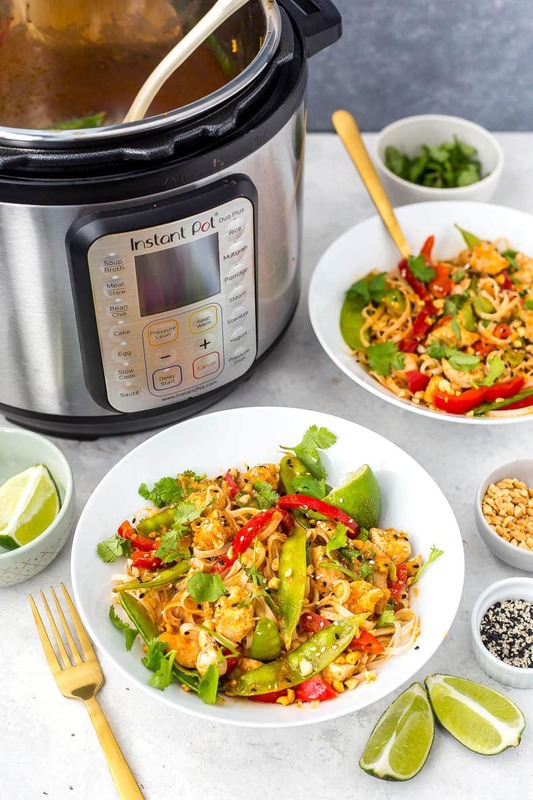 These Instant Pot Red Curry Chicken Noodles comes together in less than 30 minutes in the pressure cooker. 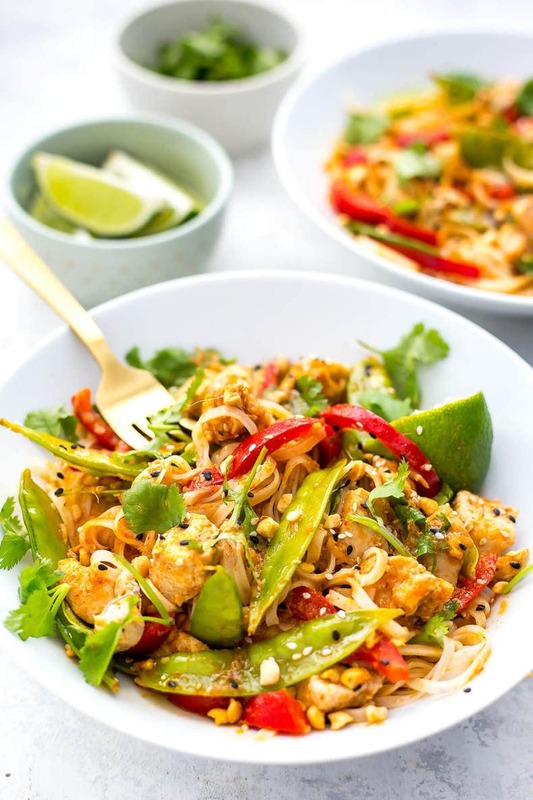 It's a healthy Thai-inspired dinner idea! Dump all ingredients except for red pepper, snow peas, rice noodles and toppings into Instant Pot. Set to manual and pressure cook on high for 3 minutes. Instant Pot will take about 10 minutes to pre-heat and then the 3 minutes to cook. When complete, press cancel and do a quick release of the steam, waiting until the pressure gauge drops back down and the lid is safe to open. Meanwhile, drizzle 1 tbsp olive oil over rice noodles. Boil water in your kettle then pour over noodles and stir, soaking in a large bowl for 1-2 minutes until noodles are just softened (they should be hard at the centre). Drain and set aside. 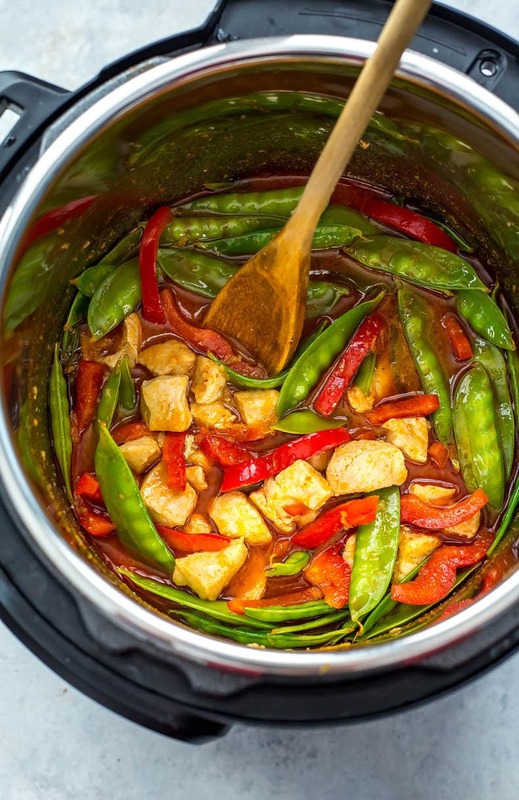 When Instant Pot is safe to open, add red peppers and snow peas then let sit for 5 minutes. Add cooked rice noodles to bowls, then top with curry mixture and toppings. Serve and enjoy! Super easy and looks delicious! Can’t wait to try this! I have got it cooking now, with some tweaks. Using green curry paste as opposed to red (since it was all i had on hand) and a bag of frozen asian veggies….cant wait to try it! Oooooh green curry sounds fantastic Sonal!!! Hope it turned out deliciously for you! What might the timing be in a regular slow cooker? Hi Kat – unfortunately I couldn’t really tell you because this isn’t a slow cooker recipe. If I had to guess, you could put the chicken and curry sauce ingredients in for 6-8 hours on low and see if it turns out, then do the noodles and veggies separate from there. Hope that helps! Made this for supper last night and it was a huge hit in our house!! From taking the stuff out of the fridge to sitting down to eat it was under 30 minutes – my kinda meal 🙂 I think next time I make it I will add a few tablespoons of fish sauce at the beginning and then in addition to the peppers and peas, add onions and bean sprouts at the end. We served it over rice as I already had some cooked. Thank you for a new meal to add to the regular rotation!!! I really want to try this recipe but I don’t have an instant pot I can do this in my crock pot or stove top? If so do any of the instructions change? Hey Melissa! You could definitely do this on the stovetop! Just put all the ingredients in a pot on the stove save for veggies, noodles and toppings. Cook for 15 minutes or so until the chicken is cooked through then stir in the veggies and cook another 5 min. Add the noodles that are cooked separately and your toppings and that should be all there is to it!